This is, of course, the granddaddy of all preconceived RPG worlds. Again it gets 3 stars because I love reading the back story and poring over the maps. Unfortunately, Gygax had a dreadful ear for names: Verbobonc, Grazz't, Hepmonaland. 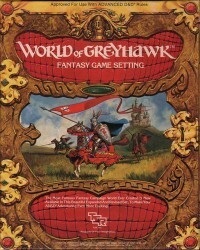 I do remember that my friends and I invented a miniatures game based on Greyhawk.